JioFiber Preview Offer is now live with 100mbps speed across some selected cities. JioFiber now offers 100GB premium data per month for 3 months. 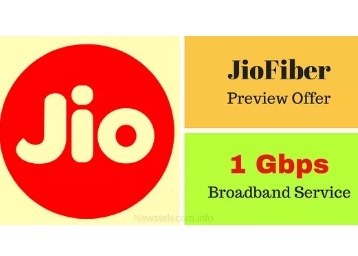 JioFiber trial plan also includes free access to Jio premium apps including JioTV, JioCinema, JioMusic, JioNews, JioXpressNews and JioCloud. Trial will remain valid for 90 days. For now you can’tas of Now, it may be available after June. The service is under trial run in several big cities of India. These cities where the trial is on are: Mumbai, Delhi, Ahmadabad, Surat, Chennai, Jamnagar, Vadodara and Pune. Under the Jio Giga Fiber Speed-based plans, prices start from Rs 1500 and go all the way up to Rs 5500. 5. With Rs 1500 recharge, user gets 2000GB data at 50 Mbps speed for 30 days. For Rs 2000, it is 1000GB at 100Mbps.